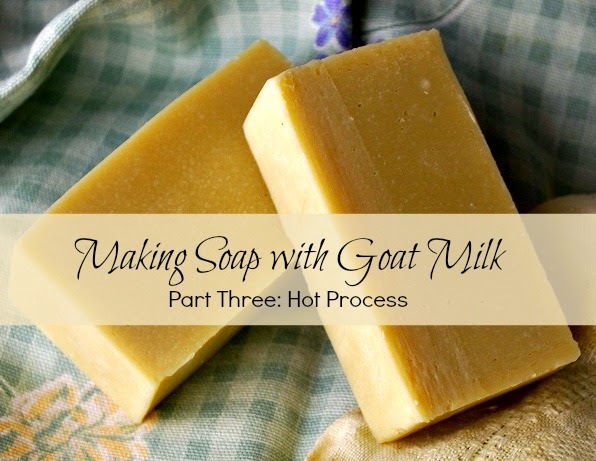 This post is part of my series on making goat milk soap. You'll find the links to the previous posts at the end of this one. Cold process and hot process begin the same way; in fact, you'd follow the instructions for making cold process soap up to the point of pouring the soap into the mold. That's where this post begins. For cold process (CP), the raw soap is poured into a mold and left for 24 hours to saponify (this is the chemical reaction), then cut and cured for 6 weeks. 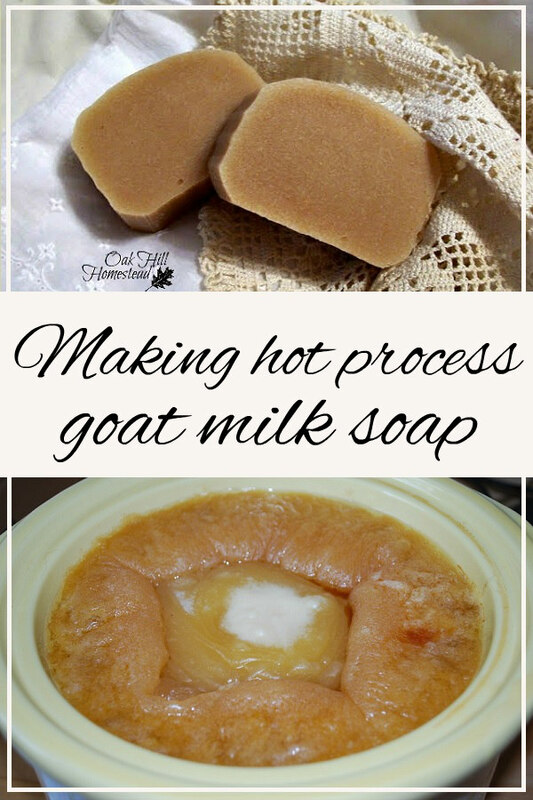 Hot process soap (HP) is poured into a slow cooker and cooked, then put in a mold. HP soap is "done" after the cook, saponification has already happened, and as soon as it is hard enough it is removed from the mold and cut; it's ready to use at that point. The longer you let it cure, the harder it will be and the longer it will last, but if you're impatient hot process might be the way to go. What additional equipment is needed to make hot process soap? A slow cooker. That's it. You might be able to find an older model at a thrift store or yard sale. I looked for quite some time but didn't find one, so I bought a new Crock-Pot (affiliate link) for my kitchen and dedicated my old one to soapmaking. All right, let's begin at the end of the cold process post when the soap reaches "trace" - the raw soap thickens and turns opaque. Instead of pouring it into a prepared mold, I pour it into my old slow cooker. I plug it in, turn it on and set it on Low, put the top on and leave it alone. I check on it every 15 minutes or so. As the soap cooks, it climbs up the sides of the slow cooker and sort of folds over on itself. More and more of the cooked soap is visible, and the uncooked center gets smaller and smaller. Eventually there's no smooth, uncooked soap left in the middle. This takes about an hour in my old slow cooker, which tends to heat up a bit more than more modern models. I stirred it up before taking the photo below. The consistency is rather like waxy mashed potatoes. This is the time to add fragrance or essential oils if you're going to scent your soap. The soap is spooned into the mold. There is no "pouring" of this soap, it has to be scooped up and plopped in the mold. Once it's all in, I do my best to pack it down and get rid of air bubbles. I gently bang the mold a few times on the table to help settle it in place. Any soap that was left in the slow cooker, on the spoon, or dropped on the top of the workbench has dried immediately. It's a good idea to cover your workspace with newspaper before this step. Notice that the top of the soap in the mold doesn't have any resemblance to "smooth". It sets up really fast; there is no way to smooth it out. As soon as the log of soap is hard enough, it can be removed from the mold and cut into bars. If you don't want this interesting-looking top on your bars, you'll need to cut the top off when you cut your bars. It looks very different from cold processed soap. It's much darker in color and the top is crumbly-looking. There are color variations in the body of the soap. I think it looks rustic and it's beautiful in its own way. It's unmolded and cut into bars in the same way as cold process; we'll do that in the next post. Hot process soap doesn't need to be cured as long as cold process soap. It's ready to use in about a week, but it will be harder and longer-lasting if it cures for a longer period of time. I prefer not to go through this extra step and I usually stick to the cold process method, but hot process does have its place if you're in a hurry. Which method would you prefer? You'll find all of the items you need to make soap in my Amazon storefront, where you can browse the items I use every day plus some fun and functional items that I'm sure you'd love to have as much as I would! Our plan is to do cold process. Kathi, we plan to use goat milk, but I don't want to freeze it or use ice water. I plan to use a sink of cold water with cold milk. Will this do anything besides make the soap a darker color? Will it keep affect the saponification process? I appreciate these posts. They have become part of my research. It will work fine, Fern. You'll have brown soap but it will be soap. I've always frozen the milk before making the soap but if someone used water, they wouldn't freeze it first. Feel free to write me if you have any questions, ok? I have not tried this method. It does make an interesting looking soap. Thank you, Sandra. It's sure different-looking, isn't it? I think the cold process is how I'll do it, I don't like extra steps! This is so helpful for me, thank you so much! I bought a book about soap-making once with the intention of learning to do it, but I think the thought of lye made me nervous and I haven't thought about it since! I love all of your pictures. They're very helpful. And aren't crock-pots great for everything??? LOL Stopping by from misAdventures bloghop. Have a great week! Hi, Quirky Homemaker. I hope you'll have the courage to try it someday if you really want to. Have a blessed week. Terri, I've read of many people who use their crockpot for food as well as for soapmaking. When the soap is finished, it's "soap" and all the lye should have been incorporated. That said, I've dedicated my old crockpot to soapmaking only. You are so making me want to try making soap. Seriously, with each new post, I am like, hey I might be able to do this! Thank you for being part of the (mis)Adventures Monday Blog Hop! I have heard of a lot of recipes for hot process goat milk soap and watched a few U Tube videos but the goat milk, honey, and oats are added after the soap cooks for 60 minutes and added at the end. One cup of ice is added first and stirred through the soap before adding the goat's milk, oats, and honey. Adding the goat's milk etc. at the end with temps much lower to 80 and not more than 90 degrees will prevent the soap from turning orange. Plus in the beginning getting ready to mix the lye would be cooling the lye way down to 80 degrees and letting the oils cool to 80 or 90 degrees. I have heard that if one chooses to use goat milk ice cubes and slowly add the lye crystals to it that it should be done while placing the goat milk ice cubes on a bed of ice to help prevent the goat's milk from scorching. There is a big difference in the appearance of the soap when the goat's milk is added at the end. 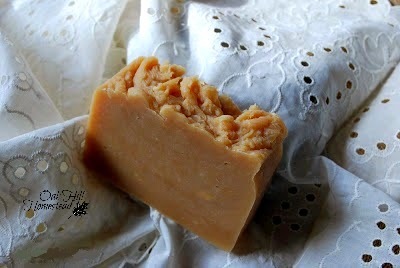 The soap will be more of a very light beige color instead of an orange color. It is better doing it like this because you do not destroy all of the beneficial properties of the goat's milk by adding it at the beginning instead of stirring it in at the end after the soap has cooked 60 minutes.